How Big Is A Corner? And with these words Ruth commits herself to her mother-in-law as they travel, poor and destitute to Bethlehem, leaving the loss, sorrow and misery they experienced in Moab behind. Naomi is bitter but her young former daughter-in-law is determined. And finally Naomi gives up trying to send Ruth away and they travel together to Bethlehem. Bethlehem is Naomi’s former home, the home where Naomi grew up, where her family lives, where she has old friends. But for Ruth, Bethlehem is a foreign place in a foreign country. 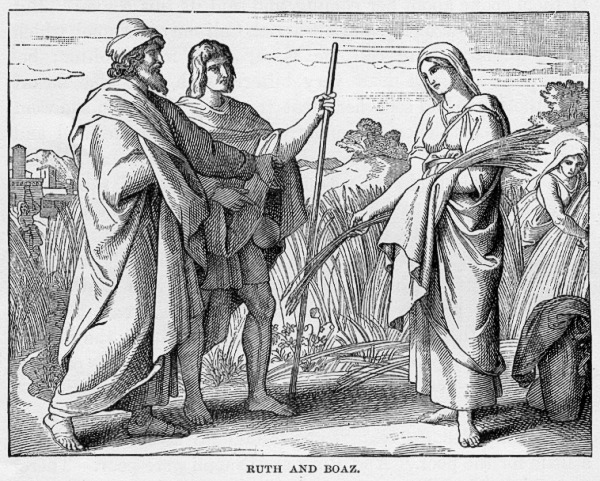 Bethlehem is even a potentially hostile place for Ruth, after all Israelites and Moabites don’t like each other very much and the Old Testament recounts much animosity and violence between them. Nevertheless Ruth is committed to Naomi and she is resolved. But after arriving the first order of business is something basic – food. These widows have nothing, even in Naomi’s ancestral home they are still poor and hungry. But it so happens that the law of Moses makes provision for widows such as Ruth and Naomi. Farmers were expected to leave the edges and corners of their fields unharvested so that the poor could come into the fields and glean whatever they could find of what was left over, missed or fallen. (Find this in Leviticus19:9-10 or Deuteronomy 24:19-22). The problem was that there was no authority who would check up on these landowners – they were expected to perform this duty on their honor. So some farmers were very generous in defining how big a corner should be and how wide to designate as the edges; and others defined it as narrowly as possible and went out of their way to discourage gleaners. Not only that but the environment for gleaners was very harsh. Not only was the work itself backbreaking and physically demanding, but the experience of dealing with the other gleaners could be very difficult. The strongest, the most aggressive would be the ones who collected the most grain. Gleaners would push and jostle for position; they would intimidate others as well. There would be violence at times and an unattached young woman would have been especially vulnerable to harassment and assault. But the word has gotten out that one landowner, Boaz, is a particularly devout and generous man. He is gracious and allows the gleaners to have more than they can get at other fields. Not only that but he seems to take issues of honor and safety seriously and as a part of his own responsibility and he specifically instructs his foreman to make sure this one vulnerable young woman in particular is treated honorably and fairly. So Ruth gleans and is successful. She also is not shy. She actually goes to Boaz and makes an outrageous request: she asks to be allowed to go where gleaners are never permitted to go – to work besides the field hands! In other words she asks to be allowed to collect grain right out of the field itself. What nerve! Gleaners always came last and they were usually only permitted into the fields once the hired workers were done. Gleaners always got the leftovers! But Ruth asks for more, Ruth asks to be allowed to take of the first fruits! And she does this, not for herself – but for her mother-in-law Naomi! And Boaz agrees! Boaz gives of his first fruits to a poor widow women who he does not know! And why? Out of a sense of responsibility. And not only that but he does it cheerfully! There is a lot going on in the story on a whole of levels, but I want to focus on this particular point today: Boaz gives of his first fruits – he defines a corner as large as possible – he does not give his leftovers! On this weekend when we focus on our own giving, Boaz becomes a model for us. How often do we simply give to God and the work of Christ’s church the leftovers in terms of both money and time? I am going here, I have this activity and that, but I have a little tiny bit of time on….. (you can fill in the rest). Or - I like to spend my money on this activity and that gadget and those things, and I have this little bit left over, so I’ll put that in my envelope. Are we guilty of that? Yes, we all are. God calls for us to follow the model of Boaz and give of our first fruits – which means 10% right off the top; God calls for us to define the corners of our lives much broader than we might be inclined and to put participating and contributing to the ministry of Christ as a high priority. 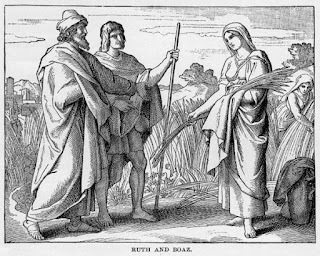 The Gospel in this wonderful story of Ruth for this day is a challenge to us to give back to God out of our abundance, willingly and gratefully – both in terms of time and financial support. Recognizing that the gifts that God has given to us cannot even be defines, and in gratitude for this we give back willingly and gratefully. And so, this is the challenge of our text today: how big as a corner?